We reviewed the X79 Extreme11 back in September 2012. The concept was simple: divert eight PCIe lanes into an LSI SAS chip for eight more SATA ports with SAS compatibility. Then ASRock released the Z87 Extreme11 which combined the LSI chip with a port multiplier, upping the total from 8+6 to 16+6. The X79 required two PLX8747 chips to also enable x16/x16/x16/x16 + LSI, whereas the Z87 only used one PLX8747 for x8/x8/x8/x8 + LSI. Now insert the X99 version of the Extreme11. It gets a bit tricky here, because SATA is not the only storage around. Add into the mix that the chipset supports 10 SATA ports on its own then there is the potential for something silly, or awesome, or perhaps a little of both. The X99 Extreme11 uses the same LSI SAS 3008 without the port multiplier, but add in the 10 chipset ports X99 already provides and it gives a total of 18. This LSI chip uses eight PCIe 3.0 lanes and supports RAID 0/1 only, but still allows ASRock to publish 6.1 GBps peak read/write when top end SATA drives are connected to each port. The X99 Extreme11, similar to the Z87, uses two PLX chips to achieve x16/x16/x16/x16 support along with the LSI chip. To throw some more into the mix, the motherboard also has two Ultra M.2 slots, with both supporting PCIe 3.0 x4 connectivity and 22x110 sized drives. 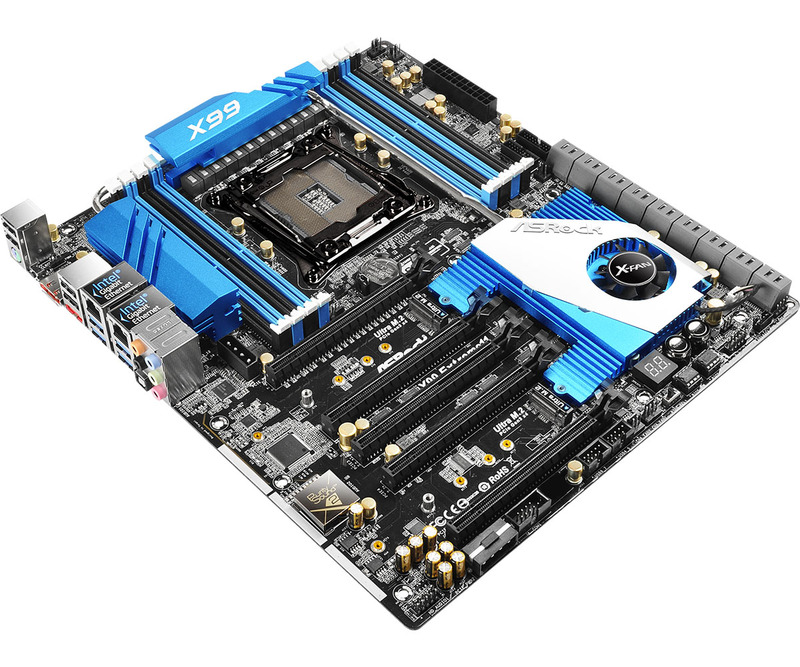 These M.2 x4 slots are still good for 2.8 GBps according to ASRock, and while they won’t be RAID capable in hardware, a software layer might provide an interesting project. The motherboard will support Xeons with either UDIMMs or RDIMMs, along with ECC support. Networking is provided by two Intel NICs, the I218-V and I211-AT, with support for Teaming. The PCIe slots will support x16/x16/x16/x16 even with the 28-lane i7-5820K, although using that CPU will disable the second M.2 x4 due to the lack of bandwidth. ASRock is keen to promote their 12-phase power design, which we see paired with large heatsinks. A heatpipe connects all three heatsinks, with the heatsink on the left there only to provide extra surface area. The chipset heatsink is also dealing with the LSI controller, hence the size and the active cooling. Users in the past often express concern about small fans like this, although it can be disconnected if the user has their own sufficient cooling. The board has eight USB 3.0 ports, six from the chipset and two from an ASMedia controller powering two of the rear IO ports. Also onboard is a COM header, seven fan headers (only two are 4-pin), Realtek ALC1150 audio in Purity Sound 2 and a dual BIOS topology. Because of the use of 4-way PCIe, there are two connectors on board for additional VGA power, although these are molex connectors which I disapprove of. One of them is to the left of the middle of the board, making cable management a nightmare. The Rear IO has two eSATA ports, both of which are shared with specific SATA ports on the motherboard, meaning only one can work at one time. The back panel also has a PS/2 combination connector, four USB 2.0 ports, four USB 3.0 ports, the two Intel network ports and audio. In ASRock’s YouTube video promoting the motherboard, they paired the system with an 18-core E5-2699 v3, 128GB of DRAM, four GTX 780 Ti cards, two M.2 x4 drives and 18 SSDs. See you later, I need to sell a kidney and perhaps a lung as well. I would not be surprised if the X99 Extreme11 ends up being the most expensive X99 motherboard on the market. The two PLX 8747 chips, as well as the LSI 3008, are not cheap for the end-user. Though if a user wants to wire up a large Xeon, a ton of memory, four GPUs, a dozen or more storage devices or any combination therein, then the price of the motherboard might be quite low down on the list. The X79 Extreme11 retailed for $600, so I suspect that this motherboard will be in the same ballpark. I have requested a review sample, and hopefully we can delve into the interesting PCIe arrangement under the hood. It will be interesting to see how everything is wired up. 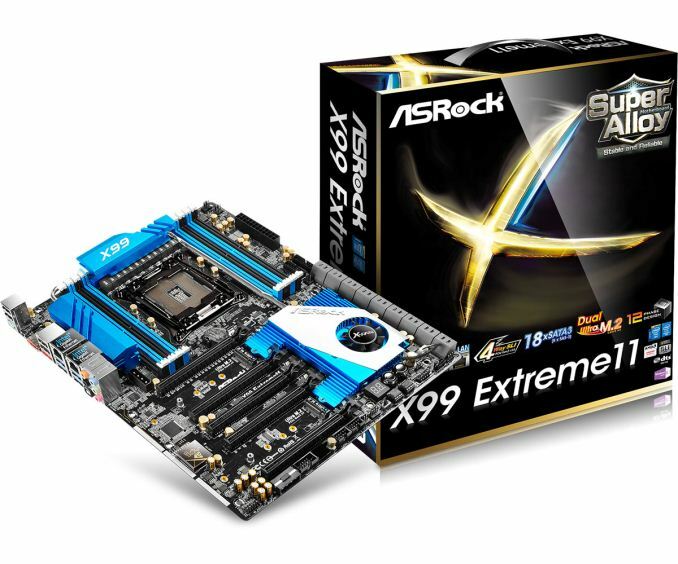 A full specification list can be found on ASRock's X99 Extreme11 page. The thing is Asrock isn't a name that comes to mind when building a mission-critical storage server...normally I'd lean toward Supermicro or Asus. no way Asrock board are terrible quality. sure they have been getting all the OC records etc lately. but those boards are thrown away after that. they don't last. The PCB's are paper thin. they actually creek and flex when you install DRAM! and not a little bit. I thought I broke the board the last time I installed ram in a asrock! I don't know, so far I am lovign my Z97 Extreme6. The dual bios works very well, nice easy flip of a switch. The in BIOS upgrade going out to the net and getting an updated version without ever having to load an OS works perfectly. And I was more worried about snapping the merely glued on heat spreader off my memory than i was about MoBo flex. I didn't notice any of the flex you mention at all. 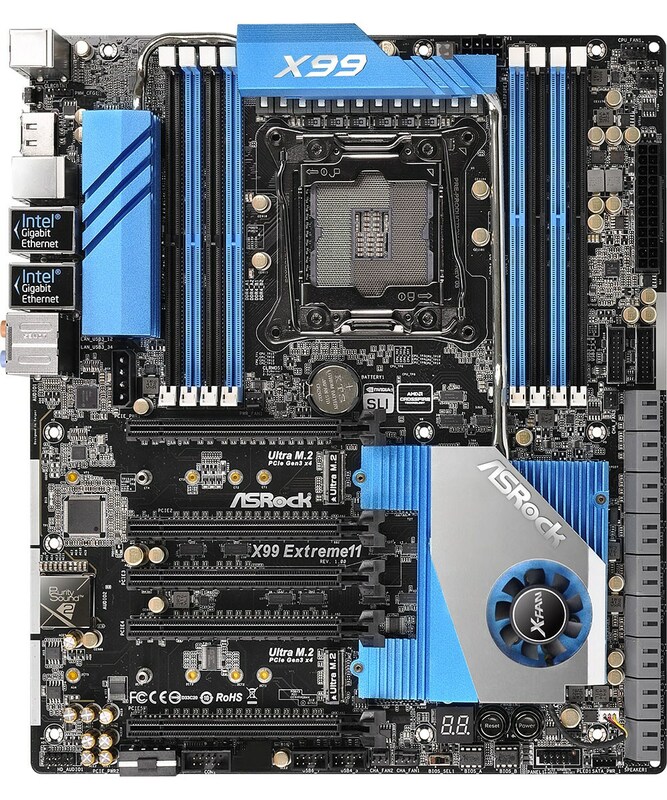 Considering the bevy of features in the Extreme6 and rock solid stability of my system since the build (granted, only thre weeks ago) I'd actually call ASRock's boards some pretty good value in the mid $100 range. Asrock uses the same parts and manufacturing plants as all the other brands. Your 'flaws' are marketing fluff. Some motherboards skip a mounting hole that's normally to the bottom left of the RAM. Other companies do this too. I normally notice more flex mounting stock Intel coolers. Notice how when it bent, it didn't crack? PCBs are normally Copper and Fibreglass, both can flex more than you'd think. "Better power?" Power has been on-board since Haswell. '8 phases' just means they used more low power chips, or they went overkill on the power system. If the power design was rubbish, the computer would constantly freeze. And Asrock would not hold any OC records. "Thicker PCB's copper shielded ones?" If trace size and shielding was a problem, the motherboard would not work. CPUs are generally digital. And they definitely wouldn't OC. "Backup BIOS." Many mainstream boards have moved to storing multiple BIOS configurations. You blow CPU's when overclocking, not BIOS chips. "Separated audio channels." Most mainstream speakers produce significantly more noise than an old-school audio design. An op amp is useful if you have high impedance headphones. That is not exactly in the chipset. It's in the CPU. I am not sure if dgingeri is still around as this is a super old thread but it seems like you're on top of this ecc functionality, on amd am3 there's extreme compatibility, it all depends on the cpu whether or not you get ecc, you can buy a $50 motherboard with a crappy chipset but as long as your cpu supports ecc you can stick it in the motherboard and get the functionality.